A few months ago we covered Comexposed 2.0 – the second edition of Zimbabwe’s biggest comic book convention that continued to put a spotlight on the local comic book scene. As the name suggested, this event was “just for show”, though. In addition to events like Comexposed, local animators have been looking for avenues to not only showcase their work but to also get paid for it as well. In tune with this objective, one local animators’ studio, Enigma Comix Africa, which is led by Eugene Ramirez Mapondera, is now distributing its titles through an online store called Euge Media. 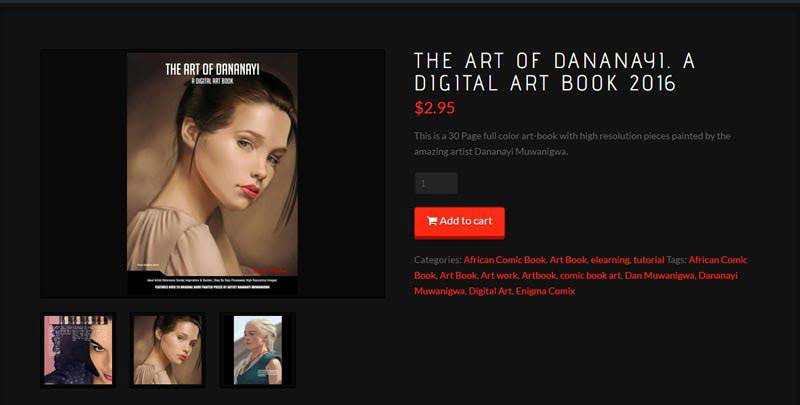 This e-store is meant to cater for comic book fans looking for Zimbabwean work but can’t buy it from physical stores. There’s also a training series with narrated videos that will walk any newbie illustrator through all the stages in the creation of characters. The content that’s available in the store right now is priced from 95 cents to the $5 for the video tutorials and people can pay using Visa and MasterCard (this includes the EcoCash card). All the stuff being sold on the EugeMedia store represents an extension and monetisation of local artistic talent through the internet which opens up this work to the whole world. According to Eugene, one interesting dynamic has been the significant interest in their work that’s been shown so far by people outside the country as local creative talent taps into a market that’s interested in Zimbabwean work. While there’s still limited work from local comic productions that’s being pushed in this way (even Euge Media doesn’t have a flood of titles yet) stores like Euge Media are worth watching because they are doing something that Zimbabwe has been failing to do – exporting. It’s quite nice to see someone doing something different. They should try providing sample content, so as to have an idea of what you are buying.